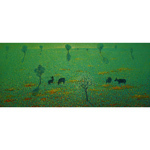 By artist Innop, this impressionist painting is partly executed with the pointillism technique. The scene depicts buffaloes grazing on a flowered field. "Happiness can be found in practicing a calm way of life according to Buddhist principles. Beauty is generated in a simple way of life that is sufficient and sustainable," says Innop. This painting was made by Innop Innop Wonga-nut. 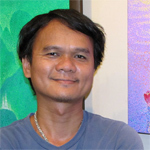 The artist was born in 1975 in Yasothon Province. He first studied at Phochang Art College in Bangkok and got a bachelor's degree in art at the Chiang Mai Institute of Technology. As a boy Buddhism played a major roll for him. He would watch his parents involving themselves in activities at the temple and would go with them when they went to rituals and ceremonies. He would always enjoy playing in the temple compound if he wasn't participating in the rituals. Innop says: "I live according to Buddhist principles, which help us leads lives filled with happiness. Remaining calm helps keep my mind clear so that I can be creative in my art works. My success is that I can do what I love. Thank you to everyone who browses my work. I hope it can give you feelings of happiness too." ... Read Innop's full biography on Ezistock Blog.